"Ears on a headband,Bow Tie, Arm Cuffs and Tail.". Foxy Fancy Dress LTD. This does not affect your statutory rights. Kitty Instant Kit. SHARE WITH A FRIEND. Includes: Headband, Bow Tie & Tail. One Size: Adult. Receive an order within 24 hours! ORDER BY 1PM. Be the First to Know.  ● Red devil horns headband with sequin horns & fluffy detailing. Novelty joke giant ears. Simply slip over your own ears, can be held in place with a little extra double sided tape or spirit gum if needed (not included). Shade may vary slightly. Made from soft rubber. Black Cat Ears Headband and Long Tail Instant Dressing Up Kit. Be a Spooky Black Cat with this fantastic Ears and Tail set. 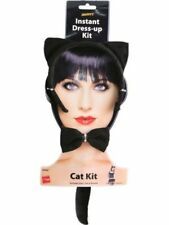 Cat Ears Headband and Tail Instant Dressing Up Kit. 1 x Cat Ears Headband. Perfect for Fancy Dress Parties or dressing up this Halloween. BROWN SOFT FURRY BEAR EARS ALICEBAND HEADBAND FOR HALLOWEEN ANIMAL ZOO FANCY DRESS. 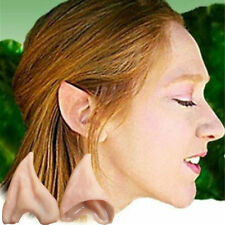 Ears, Nose and Tail perfect for Book Week or Animal Fancy Dress, Nativity etc. Foxy Fancy Dress LTD. Tail attaches via loop - can be threaded through a belt or attached with a safety pin. This does not affect your statutory rights. BUNDLE PACK This Party Bundle Package is great for your fancy dress and can be used for all types of events! Giving you a variety of products to create your dream outfit! Adult use only. This is not a toy. Keep away from children – Choking Hazard. *Warning: Keep away from Fire* ---UK Seller ---Free P&P ---Fast Dispatch ---Bundle Package ---Fancy Dress ---Kit Includes the following: 1 black TUTU,1 INSTANT CAT SET(TAIL CAT EARS HEADBAND BOW TIE) Check out our other Bundles:. 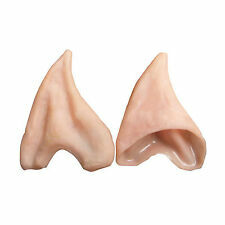 Adults witch set Includes ear points, nose, chin and liquid Rubber Ideal for Halloween or horror themed events Colour: Flesh Size: One size . 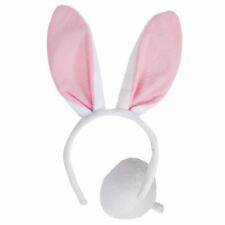 The headband is comfortable to wear and features 2 fluffy white and pink bunny ears on the top. The white pompom tail features a belt loop for easy wearing too! 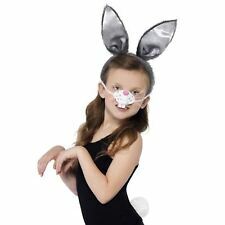 Includes bunny ears headband and tail. Instant Cat Set. One Size: Kids. Receive an order within 24 hours! Product Code: 23415. ORDER BY 1PM. Be the First to Know. Devil set with sequin detail consisting of horns on headband, tail, cuffs and bow tie. Adult carnival item. 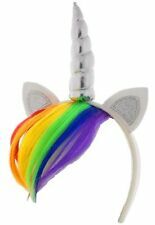 CONTAINS - CAT EARS ON BAND, TAIL AND BOWTIE. COLOUR - BLACK/WHITE. CONTAINS - 1 CAT EARS ON ALICE BAND. GREAT FANCY DRESS ACCESSORY.PERFECT FOR THAT FANCY DRESS OUTFIT OR HEN DO! Includes: Headband, Nose, Bow Tie & Tail. SHARE WITH A FRIEND. Deluxe Cat Set with Sound. One Size: Adult & Child. Receive an order within 24 hours! ORDER BY 1PM. 1 x Big Ears on Headband. Adults One size fits most. Big Night is all about making your party a big one whether its in or out, make it a Big Night! Any claims or disputes arising out of this contract must be made within an English Court. Xx78354 – Black Cat Furry Ears. Australia USA Other Countries: 2-4 Weeks.